These 3D Foam Collectible Key Rings feature characters from the fan favorite anime, Attck on Titan! 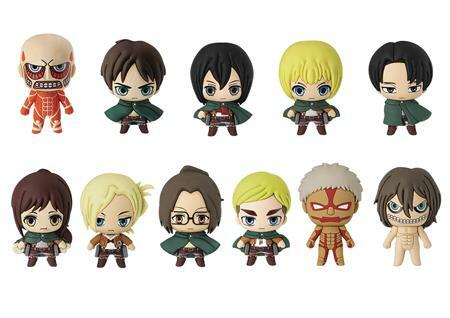 Collect Colossal Titan, Eren, Mikasa, Armin, Levi, Annie, Sasha, Hanji, Erwin, as well as our exclusive Armored Titan and Eren Titan. Each keychain comes packaged in a blind bag, collect them all!